The most important highlight of the Arm’s Reach Mini Co-Sleeper Bassinet is that, it is very flexible to use. When not used as a bassinet, it can be used as a changing table or a playing yard for the babies. These mini bassinets are very safe to use for the babies, as they have strong metal straps that can be tied along with the main beds. This way, the mothers need not lose any more sleep as they can now watch their babies sleep peacefully, in a lying posture itself. The Arm’s Reach Mini Co-Sleeper Bassinet has wheels on the sides making it easy to lift and move through narrow doorways and even down stairs. The product is also lightweight and can be dismantled easily. 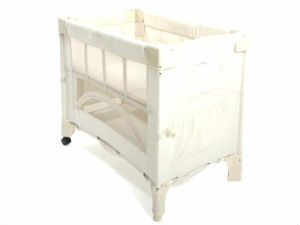 The bassinet is compact and comes with a set of soft mattresses and bed sheets. The insides of the sleeping area are made of 100% pure cotton and are very safe for the baby. There is a large storage space in the lower area of this mini bassinet. This is zipped and is much secured. This can be used to use to store the essentials of the baby like diapers, lotions, medicines etc. This is absolutely helpful for mothers who breast feed frequently in the night. They can feed the baby as they lie down, because the mini bassinets can be attached closely to the bed with tight straps. There is no need to lift the baby while feeding. This gives immense comfort to the baby as its sleeping pattern is not disturbed in anyway. Walking up and down to the nursery for diapers or medicines is also not required as the necessary things can be stored in the mini bassinet itself. The main advantage of the product is its compact size. It fits in small rooms beautifully and does not occupy too much of floor space. The double layers give lots of options for storage. The secured storage space in the lower layer is very beneficial for the parents. The small size makes it easy to lift. It is specially designed to be moved across narrow doorways as there are wheels on only one side of this bassinet. The sleeping area for the baby is entirely compose of pure cotton material to provide comfort for the the sensitive skin of a newborn. The Arm’s Reach Mini Co-Sleeper Bassinet is very flexible and can be used as a changing table for the babies too. Owing to its small size, these can be easily folded and it comes in very handy while travelling.